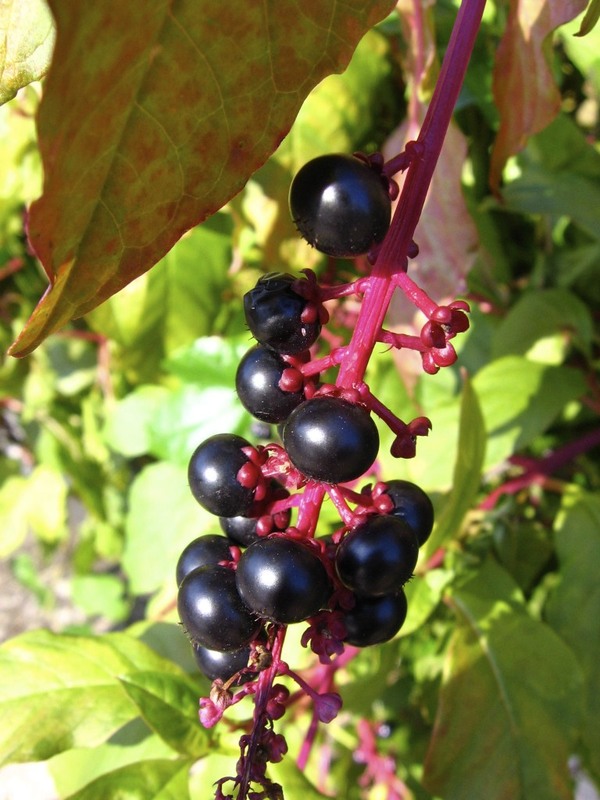 The late-summer berries of native Pokeweed (Phytolacca americana). Photo by Donna L. Long. I have been watching the ripening of the fruit on the Shadbush tree in my garden. The birds take almost all the fruit every year. But, the relationship of the birds, the plants and the seeds have much to teach us about life on Earth. In the eastern deciduous forest, where I live, over 300 species of plants depend on birds to disperse their seeds. Most trees and shrubs in North America depend on seed-dispersal by birds. Seedlings need distance from their parent plants because seeds that attempt to grow under or in close proximity to their parents often won’t do well. The tiny seedlings compete for moisture and light with well-established plants. If you watch birds you know they don’t stay in one place too long. The eat and run. They carry the seeds in their bodies and then deposit the seed as waste a distance away from the parent plant. Fleshy fruits with single hard seeds are primarily eaten by birds. Birds don’t chew and rip apart the single seed to digest it, but swallow them whole. The seed a small bird swallows is no more than three-fifths of an inch in diameter, which is the largest size seed a seed-eating bird can swallow. The whole seed is expelled as waste. Seeds pass quickly through a birds digestive system. In scientific studies on Robins and Thrushes, berries pass through the digestive tract in less than an ½ hour. The seed goes through scarification in the birds digestive system, which wears away some of the hard coating and improves the seeds chances of taking root once it is expelled in the bird’s droppings and onto soil. The bird’s droppings act as nitrogen-rich fertilizer to nourish a seedling. 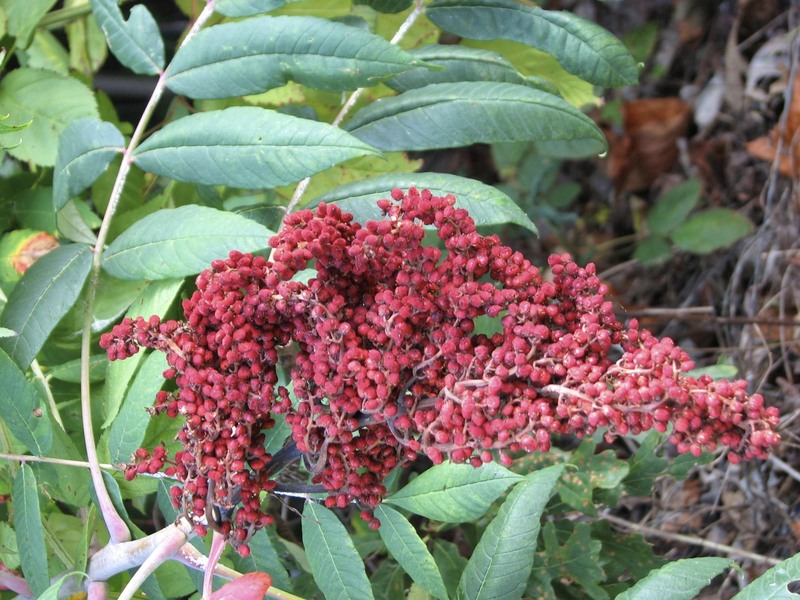 berries of Smooth Sumac (Rhus glabra) Photo by Donna L. Long. Most bird-dispersed fruits are bright red in color. Some plants have blue, black or white fruits when ripe, but the fruits are often on a plant that has red stems or brilliant red, orange or yellow fall foliage. Green or yellow seeds signal un-ripeness. Poison Ivy, a bird favorite, has ripe white berries against red stems and brilliant red fall foliage. Virginia Creeper displays ripe dark blue berries against brilliant red-orange fall foliage. “Wild” Grapes have dark blue fruits against deep yellow fall leaves. Over 70% of bird-dispersed fruit ripens in the fall, just in time for migration. Migrating birds prefer fleshy fruit which is high in fat (lipids). Low-fat fruits will be left on the plant and eaten by the winter resident birds. (link to post on winter birds) The high fat fruits help the birds to build up fat-energy stores which they will need on long flights. The fat is stored in several places in the body. I watched a bird-banding operation in the Allegheny Mountains several years ago. The bird-banders would hold a bird on its’ back in the palm of their hands. The bander would gently blow on the bird’s belly feathers to see fat stores and gauge the health of the bird. 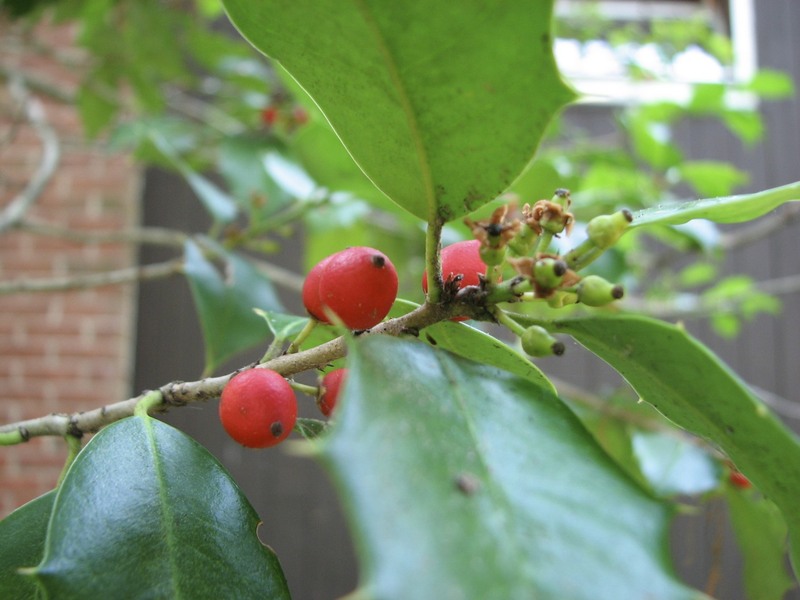 red berries of American Holly (Ilex opaca). Photo by Donna L. Long. High-fat fruits – Spicebush, Flowering and Gray-stemmed Dogwood, Southern Magnolia, Southern Arrowwood, Sassafras, Virginia Creeper, and Black Tupelo (Black Gum). Low-fat fruits – Hawthorns, Sumacs, Chokecherries, Mountain-ash roses, Mapleleaf Viburnum, Fox Grape, Poison Ivy, hollies, Red Cedar and Common Juniper. Most flower in the fall. Less than 10% fat (lipid) by weight. In the fall, birds will eat enormous amounts of food and fatten rapidly. Some birds will double their body weight. Fat yields two times more energy and water than protein and carbohydrates. Birds usually don’t fly straight through to their winter destinations, but fly several hundred miles and pause for a one or two day rest and refueling. The birds, the plants and the fruits have more than a connection, they have a deep relationship. Each helps the other to survive and promote the optimal continuation of life here on Earth. I deeply believe that humans are put here to do the same. Birds eat millions of insects which eat our crops and just plain annoy us. We can help the birds and they in turn will help us. By planting native fruits, we too can enter into a deep relationship between plants, fruits, humans and birds. For a list of the favorite native fruits of birds, get the free pdf download . For the role that fruit chemicals also play in birds and feather color, read Cardinals, Berries and Making the Color Red.